I love my iPad, and I love blogging with Wordpress but the Wordpress iPad app is TERRIBLE. 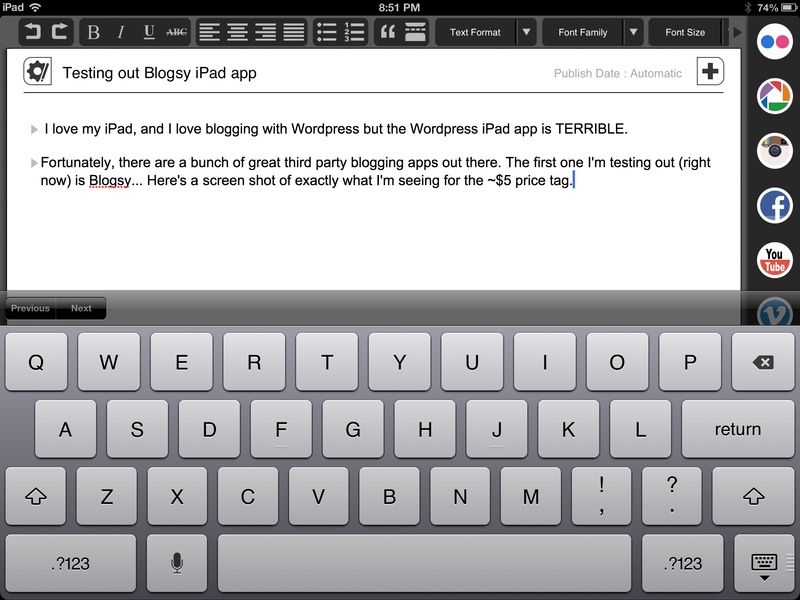 Fortunately, there are a bunch of great third party blogging apps out there. The first one I'm testing out (right now) is Blogsy... Here's a screen shot of exactly what I'm seeing for the ~$5 price tag. I'm not super technical by any means, but it took me less than a minute to connect both my blogs and another minute or so to figure out how to upload, drag and drop and make this the hero image for my Wordpress post. Overall, pretty impressed but couldn't say this app was worth more than two bucks until I watch some how-to videos and dive in a little deeper. Fortunately, I've set myself the task of documenting my thoughts pretty much every day in 2013 so there should be plenty of opportunity for exactly that. Here's to a massive year of blogging!